Baktinet is the best PC clone I have ever seen of Nintendo's popular Dr. Mario series. Similar to Tetris, the object of the game is to remove rows of similarly-colored "pills" or "virii" by lining up at least four pills/virii of one color to clear the play field. The twist that makes the game more challenging (and some fans would claim more addictive than Tetris) is that unsupported pills also collapse, so you can create cascades to remove many series at a time. Naturally, the more rows you manage to tumble, the more bonus points you will make. Baktinet features excellent SVGA graphics and superb gameplay that remains faithful to the original. But the best feature is no doubt excellent multiplayer support: up to six players can compete simultaneously over LAN or the Internet. There is also a nice solo player mode in which you have to beat the game on all four difficulty levels. 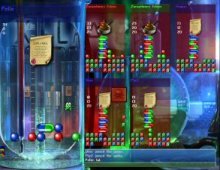 If you like TetriNET or just Tetris game in general, Baktinet is definitely a must-play. It's fun, addictive, and one of the best ways to waste coffee break time. Two thumbs up!